If you hesitated to answer even one of the questions above, you may be putting lives in danger. 1. NEVER reverse your boat to pick up a passenger. Always stop, turn around and SHUT OFF the engine before pulling someone to safety. 2. It is NEVER safe to board or exit from the water while engines are idling because the propeller may continue to spin even when the boat is in neutral. 3. And finally, an engine cut-off switch can save the driver’s life, should he or she be thrown from the boat. What exactly is an engine cut-off switch? Most commonly it is a lanyard connected to the driver, and to a switch on the control panel/dash. 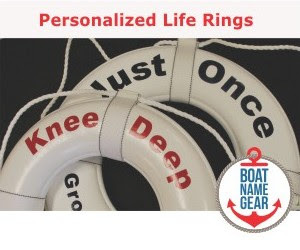 Let’s say you’re suddenly thrown overboard after an encounter with rough water or an accident on your boat. The second the lanyard device is pulled from its receptacle, the engine shuts off. Why is this important? Because if you’re thrown overboard – and the engine is still running – you are now at serious risk for a propeller strike. Wireless devices are also available in which an electronic device worn by the driver (and other occupants) takes the place of the lanyard. Editor’s note: Since the USCG brought it up in this article, this would be a good time to point out that one of our sponsors, Autotether, makes these wireless kill switches right here in our home state of Connecticut. And if you buy an Autotether Wireless System by July 31st 2012 you can get a $25 rebate. A typical three-blade propeller running at 3,200 rpm can inflict 160 cuts in one second, traveling from head to toe on an average person in less than one tenth of a second. Propeller safety is not something to be taken lightly. As a boat operator, you are responsible for every aspect of your boat; just as the driver of a car is responsible for his or her vehicle at all times. Safe drivers know to always be on the look out for pedestrians, especially in populated, urban environments. Similarly, safe boaters know to watch out for people in the water. The best rule of thumb regarding your propeller is: don’t run the engine when people are near the boat. Be alert for other boaters engaged in towing sports like tubing, wakeboarding, etc., and take every precaution to avoid them. • Personally look at the area around your boats' propeller before starting the engine. Don’t count on others. See for yourself. • Before you set out for the day, take a moment to inform your passengers of the location and dangers of the propellers, and call attention to any propeller warning labels around your boat. • Never permit passengers to ride on the bow, gunwale, transom, seatbacks, or other locations where they might fall overboard and under the boat. Accidents can happen in the blink of an eye… and so can propeller strikes. • Establish and communicate rules for swim platform use, boarding ladders, and seating. Your boat. Your rules. Be clear and firm. • Consider an engine cut-off switch or another propeller safety device, and make sure all passengers (including you) wear a lifejacket at all times. There is no “one-size fits all” solution to eliminate the risk of propeller injuries. 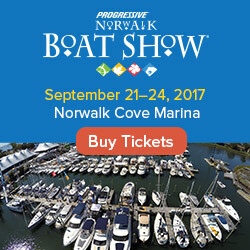 Boaters must carefully review all options and determine which devices make the most sense for their particular boating experience. The most effective preventive measure is alert, aware boaters who responsibly manage propeller injury risks. The U.S. Coast Guard reminds all boaters to “Boat Responsibly!” For more information and safety tips, visit www.USCGboating.org.